Get Vendio Gallery - Now FREE! 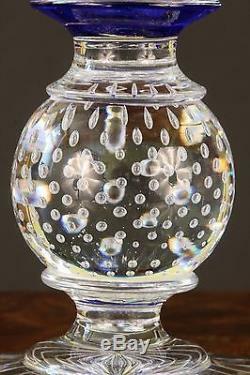 Beautiful cobalt cut-to-clear vase, hand-cut, diamond and oval design elements with characteristic Pairpoint "bubble ball", excellent condition, no apparent defects, Height: 13 inches, Diameter Top: 6 1/2 inches, Diameter Base: 4 5/8, from Pairpoint Glassworks of Mass. 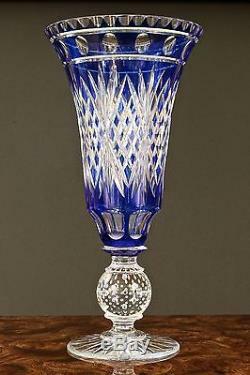 A historically prominent US glassmaker whose work is collected by design museums. 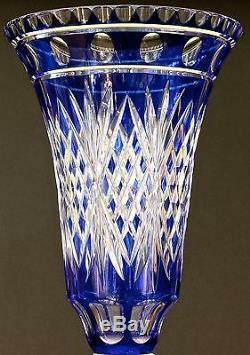 The item "Pairpoint Cut-to-Clear Cobalt Vase" is in sale since Monday, April 27, 2015. This item is in the category "Pottery & Glass\Glass\Art Glass\North American\Pairpoint/Mt. 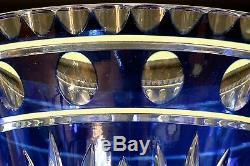 The seller is "clara727" and is located in New York, New York. This item can be shipped to United States, Canada, United Kingdom, Denmark, Romania, Slovakia, Bulgaria, Czech republic, Finland, Hungary, Latvia, Lithuania, Malta, Estonia, Australia, Greece, Portugal, Cyprus, Slovenia, Japan, China, Sweden, South Korea, Indonesia, Taiwan, South africa, Thailand, Belgium, France, Hong Kong, Ireland, Netherlands, Poland, Spain, Italy, Germany, Austria, Russian federation, Israel, Mexico, New Zealand, Singapore, Switzerland, Norway, Saudi arabia, Ukraine, United arab emirates, Qatar, Kuwait, Bahrain, Croatia, Malaysia, Brazil, Chile, Colombia, Costa rica, Panama, Trinidad and tobago, Guatemala, Honduras, Jamaica.